A panoramic image of the Milky Way arching across the night sky shot from a dark sky location. See below for a view from across the Ismaili fortress of Alamut. The stellar disk of the Milky Way galaxy is approximately 100,000 light-years in diameter. It is estimated to contain at least 100 billion stars and possibly up to 400 billion stars. Photo and caption: Wikipedia. While NASA is at the tip of everyone’s tongue, one might wonder what TWAN represents, thinking the reference is probably to Twain, the standard for linking applications and image acquisition devices. Well, TWAN stands for The World at Night, and it is an international effort to present stunning nightscape photos and time-lapse videos of the world’s most beautiful and historic sites against a night-time backdrop of stars, planets and celestial events. I first ran into the works of TWAN photographs at the NASA website, with one particular work by TWAN’S founder and leader Babak Tafreshi (pictured below) drawing a gasp of amazement and wonder from me. Born in 1978 in Tehran, Tafreshi lives in Germany but could be anywhere on the planet, from the Sahara to the Himalayas or Antarctica. He is a board member of Astronomers Without Borders organization, a photo ambassador for the European Southern Observatory (ESO), and contributing photographer at Sky & Telescope, the world’s leading astronomy magazine. He is also a science journalist, photographer, and astronomy communicator using all media. The United Nations Educational, Scientific and Cultural Organization (UNESCO) and the International Astronomical Union (IAU) designated TWAN as a Special Project in the International Year of Astronomy in 2009. Since then the project has begun to have a global exposure, and continues to grow. The TWAN-style Earth and sky photographs are being taken by some of the best landscape astrophotographers around the world. The resulting collection of nightscape photography is presented in an international traveling exhibition and in a virtual exhibition on the TWAN web site. When I approached Babak to reproduce on this website his NASA published Copyright picture, he suggested that I visit TWAN to view the Alamut images. I chose for this piece two of Babak’s stunning “starry night” photos taken against the backdrop of our galaxy – the Milky Way. Babak also responded to a few questions I asked him. Let us begin with a brief explanation of the Universe, Galaxies, the Milky Way and where the Solar System fits in this unimaginable vastness around us – the distances are staggering! The universe is a huge wide-open space that holds everything from the smallest particle to the biggest galaxy. No one knows just how big the Universe is. Astronomers try to measure it all the time. They use a special instrument called a spectroscope to tell whether an object is moving away from Earth or toward Earth. Based on the information from this instrument, scientists have learned that the universe is still growing outward in every direction. Scientists believe that about 13.7 billion years ago, a powerful explosion called the Big Bang happened. This powerful explosion set the universe into motion and this motion continues today. Scientists are not yet sure if the motion will stop, change direction, or keep going forever. A galaxy contains stars, gas, and dust which are held together as a group by gravity. There may be millions, or even billions, of stars in one galaxy. There are billions of galaxies in the universe. Galaxies are labeled according to their shape. Some galaxies are called “spiral”, because they look like giant pinwheels in the sky. The galaxy we live in, the Milky Way, is a spiral galaxy. Some galaxies are called “elliptical”, because they look like flat balls. A galaxy may be called “irregular” if it doesn’t really have a shape. A new type of galaxy was discovered recently, called a “starburst” galaxy. In this type of galaxy, new stars just seem to ‘burst out’ very quickly. The Milky Way is a a huge city of stars, estimated to be 100 billion. It is so big that even at the speed of light, it would take 100,000 years to travel across it (see top panoramic photo). All the stars in the night sky, including our Sun, are just some of the residents of this galaxy, along with millions of other stars too faint to be seen. The Sun and our solar system orbits around the center of the Milky Way Galaxy. When we leave the solar system, we find our star and its planets are just one small part of the Milky Way galaxy. We are moving at an average velocity of 828,000 km/hr. But even at that high rate, it still takes us about 230 million years to make one complete orbit around the Milky Way! 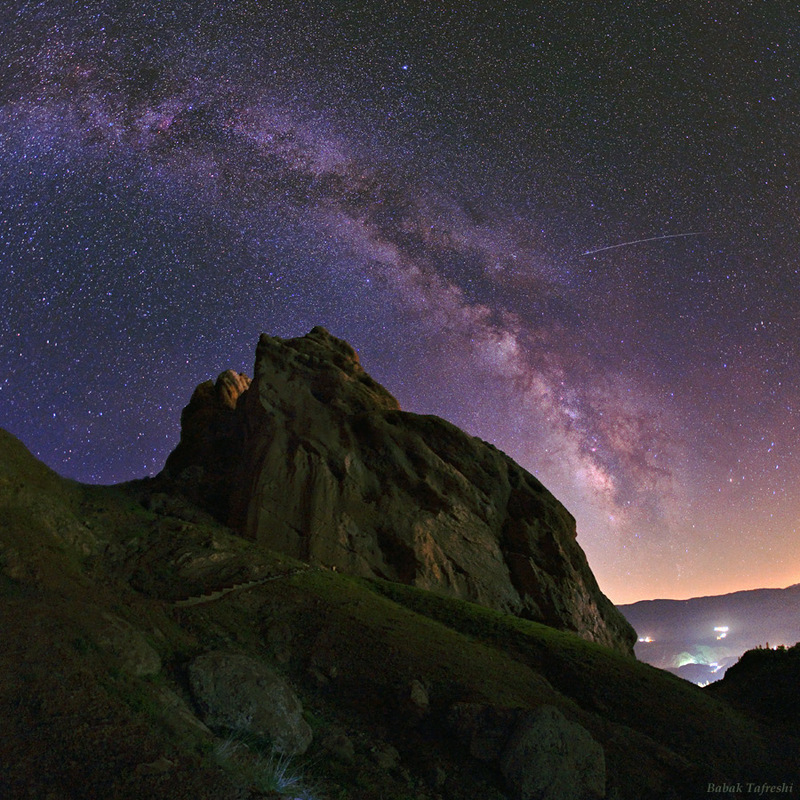 A meteor’s streak and the arc of the Milky Way hang over the imposing mountain fortress of Alamut in this starry scene. Found in the central Alborz Mountains of Iran, Alamut Castle was built into the rock in the 9th century. The name means Eagle’s Nest. Home of the Ismailis for around 170 years, Alamut was also historically a center for libraries and education. For a time, it was the residence of important 13th century Persian scholar and astronomer Nasir al-Din al-Tusi. To identify the stars in a night sky Tusi certainly pondered. Highlights include bright white stars Deneb (in Cygnus), Vega, and Altair, nebulae near the Galactic Center, and the dark obscuring dust clouds of the Milky Way also known as the Great Rift. Lights at the lower right are from small villages and the capital Tehran, over 100 kilometers away to the southwest. The next photo is a non-annotated original version of the photo. M24: The Sagittarius Star Cloud or M24 is a star cluster in the constellation of Sagittarius, approximately 600 light years wide (0.6% of the entire width of its home, the Milky Way). It fills a space volume to a depth of 10,000 to 16,000 light-years. This is the most dense concentration of individual stars visible using binoculars, with around 1,000 stars visible within a single field of view. The Galactic Center is the rotational center of the Milky Way galaxy. It is located in the direction of the constellations Sagittarius (M24), Ophiuchus, and Scorpius where the Milky Way appears brightest. The exact distance from the Sun to the Galactic center is notoriously uncertain. The latest estimates from geometric-based methods and standard candles yield distances to the Galactic center 25,000-28,000 light years. As seen on NASA's Astronomy Picture of the Day and the National Geographic News a meteor's streak and the arc of the Milky Way hang over the imposing mountain fortress of Alamut in this starry scene. Photo: Babak Tafreshi/Dreamview.net . Copyright. Simerg: Babak, your photos are stunning, so are those of your colleagues. Why Alamut? Did the “legendary” tales about Hassan Sabah and the Ismailis influence you in any way to take the photos of Alamut? Babak: Alamut was the place which really raised my passion to astronomy and sky imaging. When I was a teenager, I saw the starry sky for the first time in a trip to Alamut together with my friend Oshin Zakarian (the co-photographer of Dreamview.net). I did my first sky images in Alamut about 20 years ago. Just below the castle of Hassan Sabah was our favourite observing location. The legends and stories about the area, the enchanting beauty of Alborz Mountains and garden there, the connection with astronomer Tusi, who was here in the castle before the Mongolians arrived, were all other attractions for us. I still visit Alamut whenever I’m in Iran. Simerg: Does the mountainous area make the valley a great place for picture-taking at night? Babak: Yes indeed. As a nightscape photographer I found Alamut an amazing location where Earth and sky are merged in a beautiful natural frame. The Milky Way, the galaxy that contains the earth, extends across the sky above mountain fortress of Alamut in this all-sky view from Iran. Located in the central Alborz Mountains, Alamut Castle (2160 m) was built into the rock in the 9th century. The name means Eagle's Nest. Home of the Ismailis for 170 years, Alamut became a major center of learning and possessed a vast library. For a time, it was the residence of important 13th century Persian scholar and astronomer Nasir al-Din al-Tusi (or simply known as Tusi). The light dome at the lower right is from the capital Tehran, over 100 kilometers away to the southwest. The light on the upper right is from Qazvin, the closest major city to Alamut. Photo: Babak Tafreshi/Dreamview.net. Copyright. Simerg: What are among your favourite photos of Alamut? Babak: Other than my NASA starry image photo, which is my most favourite, I also like two other photos whose links are provided below. I shot the one of Alamut in spring, and the other superb day time photos is by my colleague. Simerg: Of all the places around the world if you had to single one out for night-time photography which spot would you select and why? 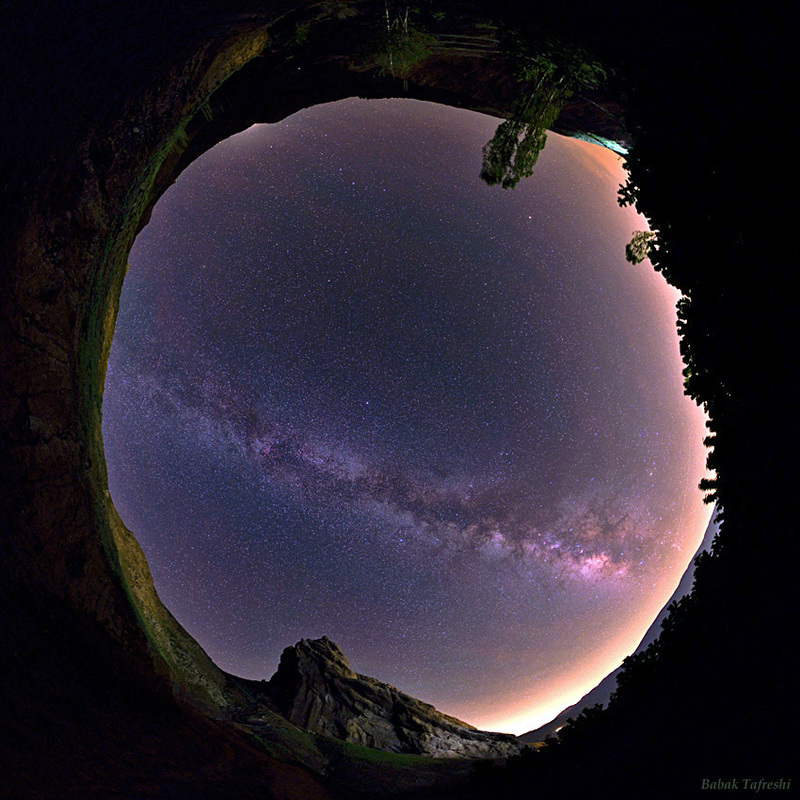 Babak: It’s not easy for me to select – I have been to many exotic location for sky imaging from Atacama Desert in Chile, which is the world’s leading site for astronomical observations, to the heart of Sahara, or Himalayas and Antarctica. But I can clearly claim that I have visited Alamut for nightscape imaging more than any other location. May be an alternative for that would be Mount Damavand in the Alborz. The slopes around the mountain offers some of the most beautiful landscape I have seen. “For many of my generation, the greatest technological miracle of this century has been sending men into space, and a remark made by an astronaut on one of the first flights in space has always remained in my mind. Looking down upon the earth he had just left he has said emotionally, “It’s one world.” He was not a Muslim. But this remark substantiated two fundamental aspects of our faith: the limitlessness of God’s power and the brotherhood of man.” Excerpt from the Aga Khan University Charter Acceptance Speech, Karachi, March 16, 1983. The image above shows International Space Station and the docked space shuttle Endeavour, flying at an altitude of approximately 220 miles. It was taken by Expedition 27 crew member Paolo Nespoli from the Soyuz TMA-20 following its undocking on May 23, 2011 (USA time). The pictures taken by Nespoli are the first taken of a shuttle docked to the International Space Station from the perspective of a Russian Soyuz spacecraft. Onboard the Soyuz were Russian cosmonaut and Expedition 27 commander Dmitry Kondratyev; Nespoli, a European Space Agency astronaut; and NASA astronaut Cady Coleman. Coleman and Nespoli were both flight engineers. The three landed in Kazakhstan later that day, completing 159 days in space. The Earth’s northern hemisphere is outlined as a sunlit crescent in this dramatic view from orbit, recorded near local midnight by the Geostationary Operational Environmental Satellite (GOES-8) on June 22, 1996. That date was two days after the Solstice, by astronomical reckoning, the first day of summer in the north and winter in the southern hemisphere. Looking south along the Earth’s limb, atmospheric scattering of sunlight causes the limb to be visible beyond areas directly illuminated by the sun. Credit: GOES Project, GSFC, NASA. 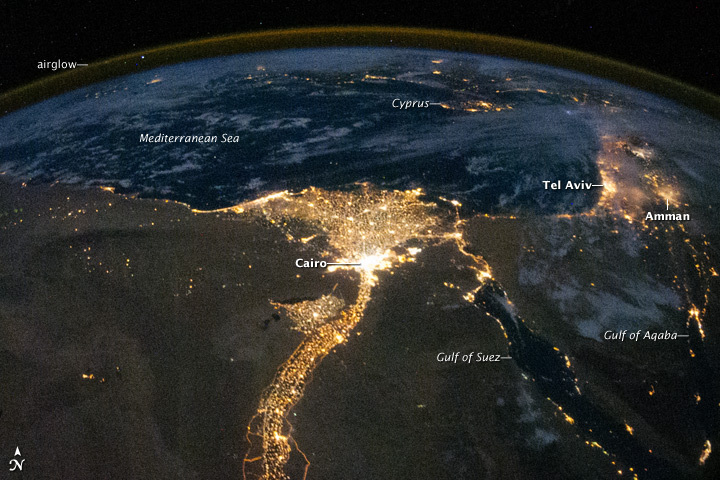 The Nile River Delta at Night. See explanation bwlow. Photo: NASA. The Nile River and its delta look like a brilliant, long-stemmed flower in this astronaut photograph of the southeastern Mediterranean Sea, as seen from the International Space Station. The Cairo metropolitan area forms a particularly bright base of the flower. The smaller cities and towns within the Nile Delta tend to be hard to see amidst the dense agricultural vegetation during the day. However, these settled areas and the connecting roads between them become clearly visible at night. Likewise, urbanized regions and infrastructure along the Nile River becomes apparent. Another brightly lit region is visible along the eastern coastline of the Mediterranean—the Tel-Aviv metropolitan area in Israel (image right). To the east of Tel-Aviv lies Amman, Jordan. The two major water bodies that define the western and eastern coastlines of the Sinai Peninsula—the Gulf of Suez and the Gulf of Aqaba—are outlined by lights along their coastlines (image lower right). The city lights of Paphos, Limassol, Larnaca, and Nicosia are visible on the island of Cyprus (image top). Scattered blue-grey clouds cover the Mediterranean Sea and the Sinai, while much of northeastern Africa is cloud-free. A thin yellow-brown band tracing the Earth’s curvature at image top is airglow, a faint band of light emission that results from the interaction of atmospheric atoms and molecules with solar radiation at approximately 100 kilometers (60 miles) altitude. The above astronaut photograph (ISS025-E-9858) was acquired on October 28, 2010, with a Nikon D3S digital camera using a 16 mm lens, and is provided by the ISS Crew Earth Observations experiment and Image Science & Analysis Laboratory, Johnson Space Center. The image was taken by the Expedition 25 crew. The image in this article has been cropped and enhanced to improve contrast. Lens artifacts have been removed. Clusters of yellow lights on the Indo-Gangetic Plain reveal numerous cities large and small in this astronaut photograph of northern India and northern Pakistan. Full explnation below. Photo: NASA. Clusters of yellow lights on the Indo-Gangetic Plain reveal numerous cities large and small in this astronaut photograph of northern India and northern Pakistan. Of the hundreds of clusters, the largest are the capital cities of Islamabad, Pakistan, and New Delhi, India. (For scale, these metropolitan areas are approximately 700 kilometers or 435 miles apart.) The lines of major highways connecting the cities also stand out. More subtle, but still visible at night, are the general outlines of the towering and partly cloud-covered Himalayas to the north (image left). A striking feature is the line of lights, with a distinctly orange hue, snaking across the center of the image. It appears to be more continuous and brighter than most highways in the view. 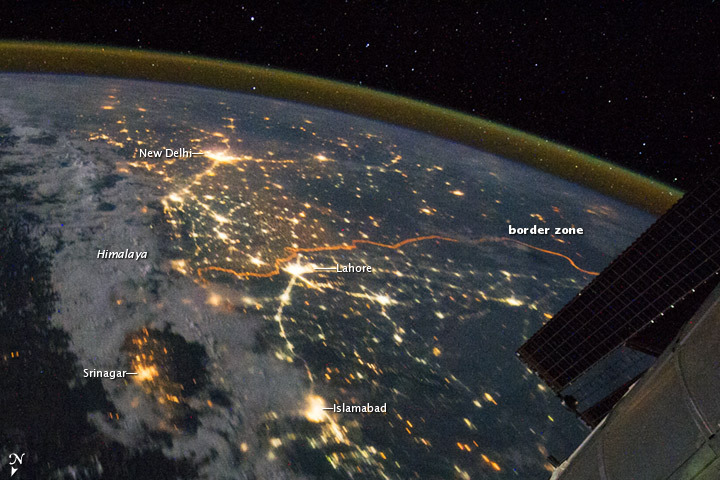 This is the fenced and floodlit border zone between India and Pakistan. The fence is designed to discourage smuggling and arms trafficking. A similar fenced zone separates India’s eastern border from Bangladesh (not visible). This image was taken with a 16 mm lens, which provides the wide field of view, as the International Space Station (ISS) was tracking towards the southeast across India. The ISS crew took the image as part of a continuous series of frames, each with a one-second exposure time to maximize light collection. Unfortunately, this also causes blurring of some ground features. The distinct, bright zone above the horizon (visible at image top) is airglow, a phenomena caused by excitation of atoms and molecules high in the atmosphere (above 80 kilometers, or 50 miles altitude) by ultraviolet radiation from the Sun. Part of the ISS Permanent Multipurpose Module and a solar panel array are visible at image right. The above photo (ISS028-E-29679) was acquired on August 21, 2011, with a Nikon D3S digital camera using a 16 mm lens, and is provided by the ISS Crew Earth Observations experiment and Image Science & Analysis Laboratory, Johnson Space Center. The image was taken by the Expedition 28 crew. The image has been cropped and enhanced to improve contrast. Lens artifacts have been removed. The city lights of Spain and Portugal define the Iberian Peninsula in this photograph from the International Space Station (ISS). Several large metropolitan areas are visible, marked by their relatively large and brightly lit areas, including the capital cities of Madrid, Spain—located near the center of the peninsula’s interior—and Lisbon, Portugal—located along the southwestern coastline. The ancient city of Seville, visible to the north of the Strait of Gibraltar, is one of the largest cities in Spain. The astronaut view is looking toward the east, and is part of a time-lapse series of images. The network of smaller cities and towns along the coastline and in the interior attest to the extent of the human presence on the Iberian landscape. The blurring of city lights is caused by thin cloud cover (image left and center), while cloud tops are dimly illuminated by moonlight. Though obscured, the lights of France are visible near the horizon line on the upper left, while the lights of northern Africa are more clearly discernable at right. The faint gold and green line of airglow—caused by ultraviolet radiation exciting the gas molecules in the upper atmosphere—parallels the horizon (or Earth limb). The Iberian Peninsula is the southwestern-most of the European peninsulas (together with the Italian and Balkan peninsulas), and includes the Principality of Andorra, as well as the Kingdom of Spain and the Portuguese Republic. The approximately 590,000 square kilometer landmass is bounded by the Atlantic Ocean to the northwest, west, and southwest and the Mediterranean Sea to the east. Its northeastern boundary is marked by the Pyrenees mountain range. The above photo was acquired on December 4, 2011, with a Nikon D3S digital camera using a 24 mm lens, and is provided by the ISS Crew Earth Observations experiment and Image Science & Analysis Laboratory, Johnson Space Center. The image was taken by the Expedition 30 crew. The image has been cropped and enhanced to improve contrast. Lens artifacts have been removed. The International Space Station Program supports the laboratory as part of the ISS National Lab to help astronauts take pictures of Earth that will be of the greatest value to scientists and the public, and to make those images freely available on the Internet. Additional images taken by astronauts and cosmonauts can be viewed at the NASA/JSC Gateway to Astronaut Photography of Earth. Caption by William L. Stefanov, Jacobs Technology/ESCG at NASA-JSC. Instrument: ISS – Digital Camera. Photographed by an Expedition 28 crew member onboard the International Space Station, this image shows the moon at center, with the limb of Earth near the bottom transitioning into the orange-colored troposphere, the lowest and most dense portion of the Earth’s atmosphere. The troposphere ends abruptly at the tropopause, which appears in the image as the sharp boundary between the orange- and blue- colored atmosphere. The silvery-blue noctilucent clouds extend far above the Earth’s troposphere. 1. Simerg would like to thank Ismaili astrophysicists Arif Babul (Vancouver and Victoria, Canada) and Farzana Meru (of the UK, currently in Germany) for their helpful pointers to source materials related to the pictures shown in this piece. To view more photos of Alamut, please visit http://www.twanight.org/, and enter “Alamut” in search box. Please explore the NASA website, www.nasa.gov, for outstanding photos of the universe. The website is for the entire family to enjoy and gleam from. This is an amazing and worth cherishing article I have ever read. While reading this article I felt I had made a journey in Allah’s untouched creation. Alahamdulillah ! Absolutely stunning! Evey time I read about or come across images of galaxies, nebulae, blackholes, stars or the universe in general, drowns me deeper into a feeling of mystery, thinking how big the universe actually is. Will the human race ever find out? Great photos and a great article. Thank you. When you look deeply to each photo it gives us a sense of thought of Allah’s creation of the universe. Wonderfull content in both the pictures and the article. Thank you, Simerg, for sharing. Remarkable pictures. Thanks for sharing with all of us. Allah bless you. Well done Simerg – a great scoop and simply stunning. Stunning views and great text. Thanks for sharing. Ok, so this is fabulous! I so needed to see this today. Thank you. The Glory of Creation continues each day…all the Time. Shukr al hamdu lillah. Wonderful article and amazing photos! Thanks for sharing! Nobody can surpass what Nature creates. Man has created so many wonderful things but this will never outstrip what God and Nature has done. Very very good article and photos. Thanks. The combination of pictures and explanation give a touch of the great past of our history. This piece and photography is absolutely brilliant….it makes me realize, once again, not only how absolutely stupendously beautiful our planet is but also how really insignificant our daily worries of day to day living are in the bigger scheme of cosmic history…. well done both of you…! Kudos! Unimaginable photographs. Thank you for sharing such beautiful work. May Mowla Bless you. Wonderful article and great pictures. Fascinating study of cosmos.Thank you for this informative article.